After much anticipation, the 2018 NZSA Conference kicked off on Sunday 28 October with 150 delegates landing in stunning Queenstown to beautiful sunshine and a relaxed opening reception at Rydges hotel. Following drinks, canapes and a first networking opportunity, delegates were encouraged to group up and take the opportunity to explore and sample some of Queenstown’s local cuisine. The conference opening took place on Monday morning, with a formal welcome by NZSA President Andrea Gluyas followed by the first of our keynote speakers, renowned Kiwi innovator Ian Taylor. Delegates were left buzzing by Ian’s hugely inspiring story of technological innovation, Kiwi ingenuity and the remarkable results that can be achieved by small teams with limited resources. Ian’s speech was followed by the first three sessions from the packed concurrent programme. Once again, concurrent session speakers throughout the programme had outdone themselves with the many high quality presentations across a range of varied topics. Next came a plenary session on the Future of CPD by Peter Withey and the NZSA CPD Taskforce, represented by the Taskforce’s convenor Peter Brown. Peter Withey shared the innovative new CPD framework that the Actuarial Society of South Africa has developed, which takes an outcomes-based and self-driven approach to CPD, in contrast to the traditional time-based approach. Peter Brown then talked delegates through the results of the Taskforce’s recent review of the NZSA’s CPD framework and the recommendations from that review. Monday’s programme was rounded out by keynote speaker Scott Pickering, the Chief Executive of ACC, who spoke passionately about the transformative journey he has led ACC on to becoming a truly customer-centric organisation. With the day’s conference sessions concluded, it was time for a classic Queenstown adrenaline rush with a jetboat ride! An adventurous group of 25 delegates set out from the pier for a breathtaking trip across the lake and up the Shotover river. For one group, which included the presidents of both the NZSA and the Actuarial Society of South Africa, the trip was more hair-raising than expected when their boat became grounded and all passengers had to transfer to another jetboat, wading through waist high water. Despite this unexpected, wet and chilly diversion, the group was enthusiastic and keen to continue their ride, demonstrating an intrepid spirit to be proud of! This was followed by Monday’s evening function, Taste of Queenstown, which was held at a lakeside restaurant and featured wine tasting stations from a selection of renowned Queenstown wineries. Delegates had been kept guessing with the promise of surprise entertainment, and were not disappointed, being treated to a hilarious comedy set by award-winning Kiwi comedian Ben Hurley. Ben was also able to demonstrate his absolute professionalism when another unexpected event occurred, specifically a power cut at the venue. With barely a pause, Ben encouraged the crowd to use their phone torches to illuminate the stage and he continued with his act, making his performance all the more memorable! Tuesday’s presentation programme comprised a combination of keynote and concurrent sessions, opening with Jarrod Kerr, Kiwibank’s Chief Economist. Jarrod shared a highly informative presentation on the current state of both the NZ and global economies – including an analysis of the interest rate environment going back much further into history than typically seen, 5,000 years to be precise! The presentations concluded with a keynote session by Lance Burdett, ex-police negotiator turned resilience coach. Lance’s energetic session provided valuable insights into the challenges that we, and our over-active brains, face in this fast-paced world and shared a range of useful tips for handling stress, sleeping better and becoming more resilient. 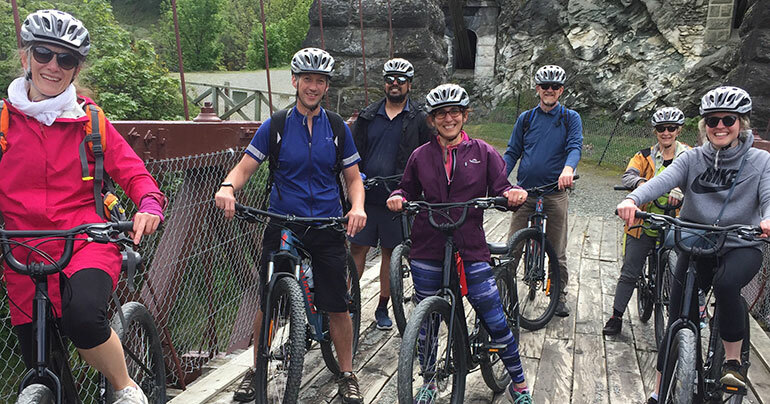 Tuesday afternoon was filled with a selection of exhilarating activities for delegates to choose from, including canyoning, zip lining, luging, quad and mountain biking, as well as a range of scenic and gourmet tours, and gave a great opportunity for delegates to experience more of Queenstown’s famed outdoor environment. The day concluded with a gondola ride up to the iconic Skyline restaurant for the Gala Dinner, where delegates were treated to breathtaking views, a sumptuous three-course dinner and a chance to hit the dancefloor. The second year of the annual NZSA awards were also presented at the gala dinner, with Herwig Raubal receiving the Gold Award, John Melville and Peter Davies being recipients of the Distinguished Service Award, Jessie McCreary and Ian Collins being recipients of the Young Volunteer Achievement Award and Joe Benbow receiving an Honourable Mention. The final day of the conference commenced with the NZSA’s Annual General Meeting which was well-attended and concluded with Andrea Gluyas handing the presidential reins over to John Smeed as the next NZSA president. The AGM was followed by Professor James Renwick’s keynote speech on climate change and climate prediction, which presented a sobering picture and challenged delegates to consider what more they can do in the face of this climate crisis. A further and final concurrent session then led onto our final keynote speaker Malcolm Law, who shared his awe-inspiring and extraordinary story, from running New Zealand’s 7 great walks in just 7 days to other epic adventures and raising over $800,000 along the way. He closed his session with the inspiring message that ordinary people really can achieve extraordinary things and his motto to ‘dream big, live big, do good, inspire people’. The conference was brought to a close by John Smeed, as the newly appointed NZSA President. All in all, it was an action-packed few days of inspiring presentations, exciting activities, and networking and connecting, and we hope that all delegates had as much fun as we did! We would like to say a huge thank you to everyone who was involved in organising and supporting the conference, including all of our sponsors for their generous support, as well as all delegates, speakers, and invited guests. Looking forward to seeing you all next time in 2020!